Have I ever mentioned that I love my job? Yesterday, Saturday, was – for me – a perfect day. 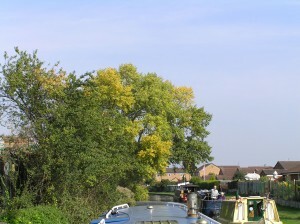 I spent an hour in the morning cutting back the low hanging ash branches on the wharf lawn and the elder branches above the grassy bank where we park our recently acquired telehandler (fork lift truck), roped off a section of footpath between our online moorings and Napton reservoir where the footpath has been undermined by a leak from the canal into the reservoir, then spent the rest of the morning and early afternoon felling and removing infected oak. I don’t enjoy destroying twenty year old oak, but I love working in the peace and quiet of the woodland with the autumn sunshine filtering through the trees and the crackle of fallen leaves underfoot. I’ve now removed about sixty of the one hundred and twenty infected oak. I may only have 50% of the trees left to cut, but I have at least 75% of the work ahead of me. The wood isn’t very large as woods go but the remaining oak are at least 200m from the nearest point where I can park the truck. Every trunk, branch and leaf has to be dragged out of the woods and loaded onto the truck for transportation. The time of the year influences how much work I have to do too. The last few months have been pretty dry so the ground next to the woods is firm enough to drive the truck over without damaging the grass. All that is about to change though. 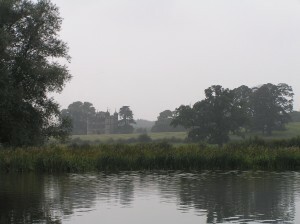 October normally heralds the start of the autumn rains. We only need two or three days of rain to soften the ground enough to prevent vehicles from driving onto the grass without making a mess which will mean that shortly I will have to carry or drag the cut timber even further. Yesterday was dry, sunny and a real pleasure to be alone in the woods talking to the trees. Alone that is until my radio interrupted my daydreaming with a request to go on a rescue mission. One of the narrowboats we look after for the Royal Navy had broken down at Braunston between the lock flight and the entrance to Braunston marina. One of our engineers had been out to it and determined that the boat couldn’t be repaired out on the canal. It would have to be brought back to Calcutt to be fixed. 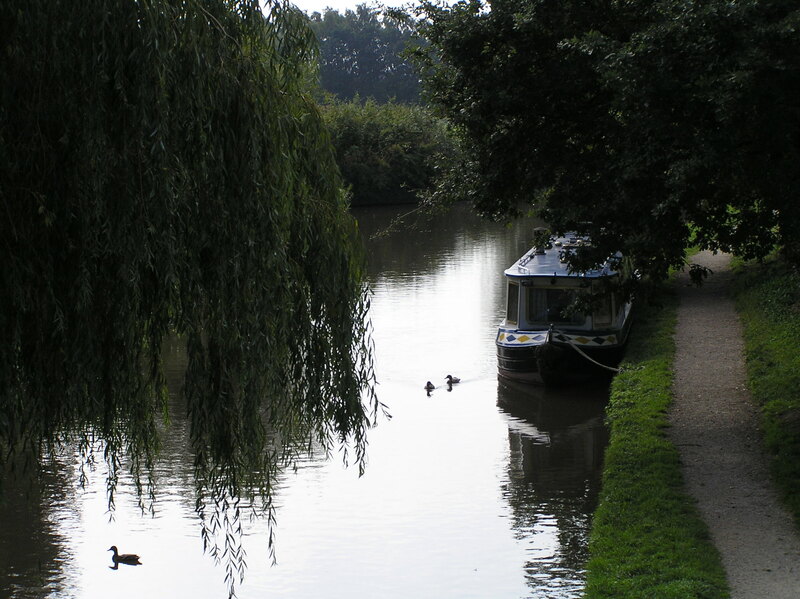 Bringing it back to Calcutt would necessitate taking one of our hire boats to Braunston to use to tow the navy boat back to Calcutt. 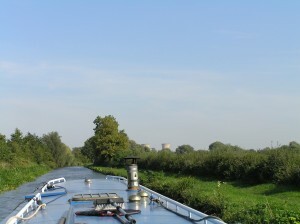 I left Calcutt yesterday at 4.30pm for a quick cruise to Braunston. It would have been quicker if I hadn’t been stuck behind a boat intent on cruising at a maximum 2mph. I thought for the first couple of hundred metres that he was looking for somewhere to moor up because of his speed and the way he was zig-zagging from one side of the canal to the other. He wasn’t. He was just in his own little world, enjoying the scenery at his own very leisurely pace. I decided to do the same. Eventually he pulled over to let me pass, I increased speed, and so did he. He stayed on my tail all the way to Braunston. I couldn’t work it out but it didn’t matter. 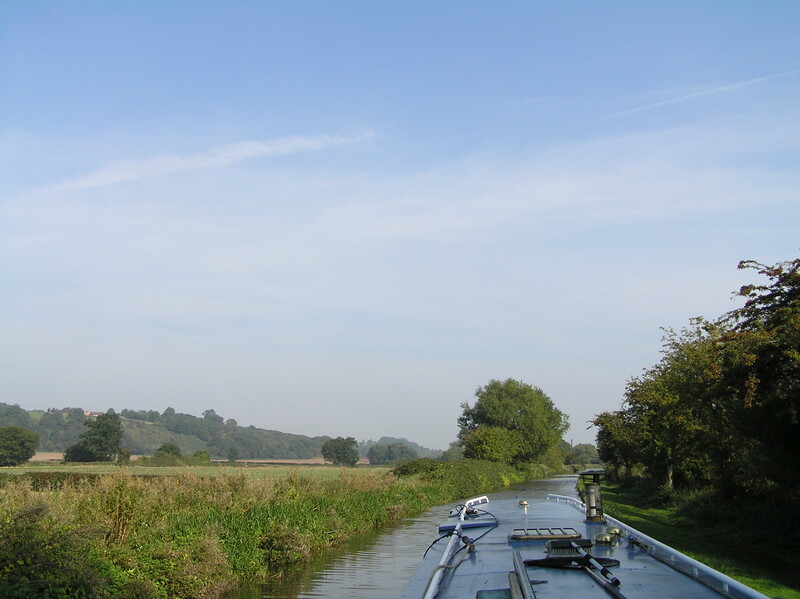 I was out on the cut enjoying a pleasant autumnal cruise… and being pad for it. I arrived at Braunston at 6pm, moored just before the junction then walked along the towpath towards the Braunston flight to find the navy boat and to make sure that I could turn my rescue boat near where it was moored. I found the navy boat next to the entrance to Braunston marina. An entrance I can use to turn my hire boat when I go back there later today. 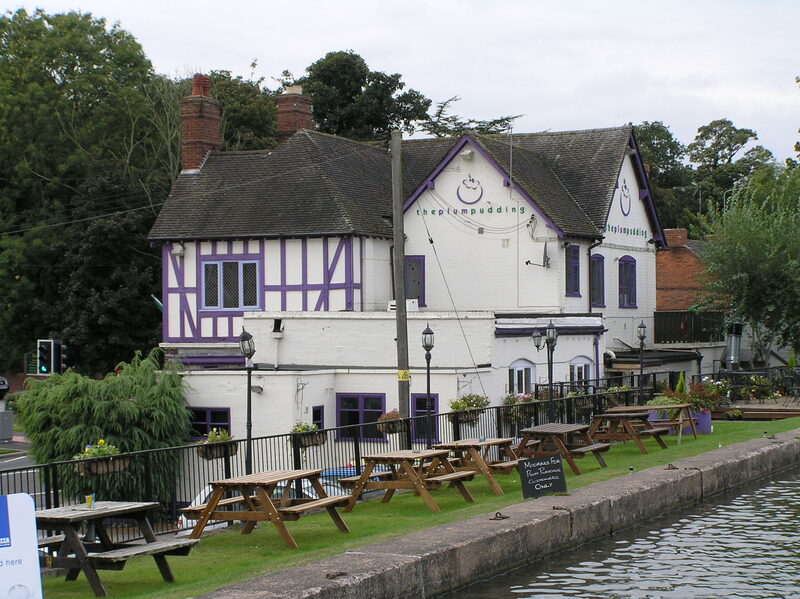 I waited in the Boathouse in Braunston for Steve Cox from the office to pick me up and bring me back to the marina. Of course, we had to have a pint when he arrived. The purchase of two pints in a canal side pub reminds me why I don’t drink in pubs much any more. Seven pounds for two pints! I can buy one and a half bottles of very good Australian red for that much in a supermarket. At £3.50 a pint it’s fourteen times more expensive than the first pint I ever bought in a pub. Mind you, that first pint was thirty six years ago in a spit and sawdust pub in a particularly unpleasant part of Birkenhead. I was back at the boat by 8pm for a quick bite to eat, X Factor (I love it), bed and an early start to finish the newsletter before returning to Braunston at 11am. I’m just about to leave now. To be honest, I’m a little nervous. There’s a stiff easterly breeze blowing which isn’t going to make the journey back with a total boat length of 110′ any easier on a day when I can expect there to be plenty of traffic. Whatever happens, it will be an adventure. I’ll tell you how much of an adventure next week. Earlier this week I was given a very clear demonstration of the difficulty in burning felled wood which hasn’t been seasoned. Last week I told you about the problem we have with our oak trees. 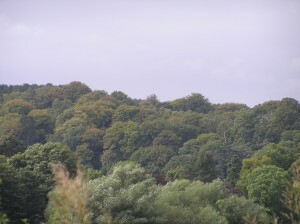 There are about 120 diseased trees in total which need to be removed from the woodland and, because the timber is infected, burned immediately. So far I have removed forty twenty year old trees, cut them into manageable sections and moved them to our tip area where they are in an enormous 5th November sized pile waiting to be incinerated. I haven’t burned them before now because we have strict instructions on how and when to light fires. 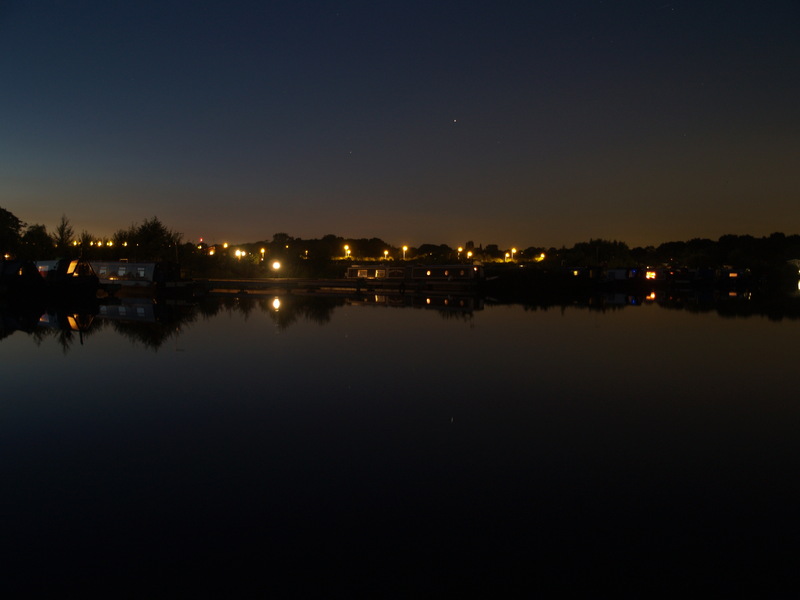 The tip area is to the west of the original Locks marina and to the south west of the newer Meadows marina. The prevailing wind is south westerly so most of the time, if a fire is lit, the smoke and ash blows across either one or the other marina and understandably upsets boaters, especially if they have just spent hours polishing a boat to find it covered in a fine layer of ash. We have to wait until there’s an east wind blowing. It doesn’t happen very often. Normally it’s not a problem as there isn’t much to burn. 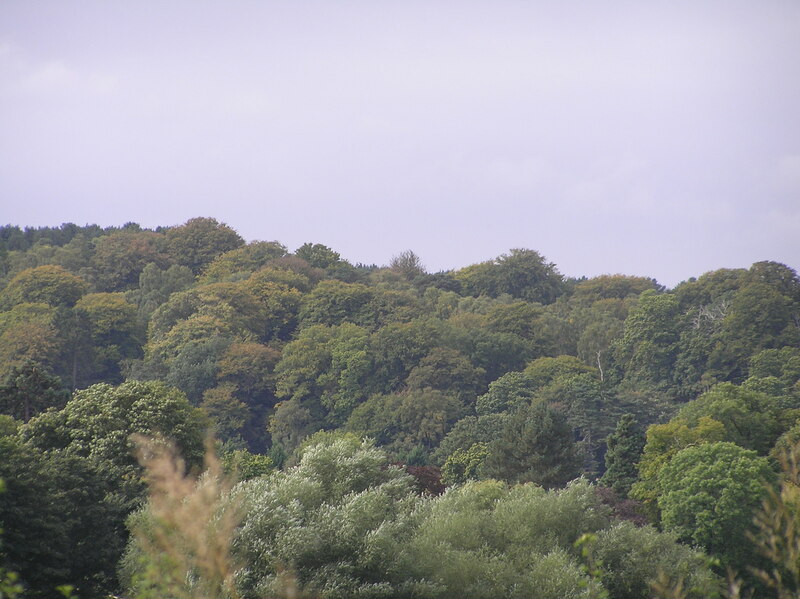 There has been recently with the continuous felling of infected oak. There was a light breeze from the east on Tuesday so oak burning was the order of the day. I don’t normally have a problem lighting a fire. After all, I did spend a year as a boy scout… before being asked to leave as I was considered a bad influence on other scouts. 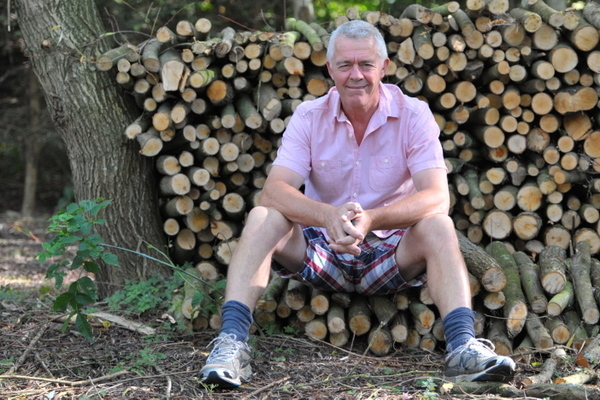 Normally I use a newspaper, sheets separated and screwed up, under a pile of cardboard boxes and then any cut timber – usually willow – over the top of the cardboard mixed with offcuts from our woodshed. Recently cut timber is usually a fairly small part of the overall mix. On Tuesday 95% of the bonfire was recently cut oak and it didn’t want to burn. I tried my usual method with no success at all. I threw a gallon of petrol onto the fire and lit that. The petrol burned wonderfully, but not the oak. I added twenty five litres of diesel to the already burning paper and cardboard. Again, the diesel burned wonderfully, but not the oak. I’ve now run out of options. I simply can’t light the oak. Most recently cut timber is hard to light because of the high water content, water content which can be as high as 45%. The timber needs to be left, usually for a year or more to “season”, before it’s any use as a fuel. If logs are burned before they are properly seasoned, if you can get them lit at all, more energy is used evaporating the log’s liquid content than is used to produce heat. I see, and hear of, no end of boaters who carry a chainsaw around with them so that they can cut up felled logs into manageable lumps for the fire. I suspect some, a very small minority, do the tree felling themselves. The cut timber is then piled onto the roof ready for burning later. But how much later do they burn it? 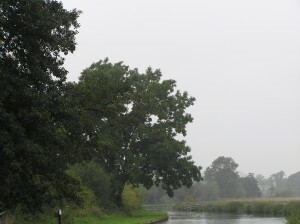 Oak is one of the most common trees in the UK and can often be seen along the side of the canals and rivers as you travel. There’s often windfall branches or felled branches or trees within sight of the waterways but, firstly, it isn’t there for every passerby to help themselves to and, secondly, it’s no good as fuel until it’s seasoned. Oak takes up to two years to season properly. If done properly, it’s left outside during the warmer months where the wind and the sun can help dry it out and then taken under cover for the winter. 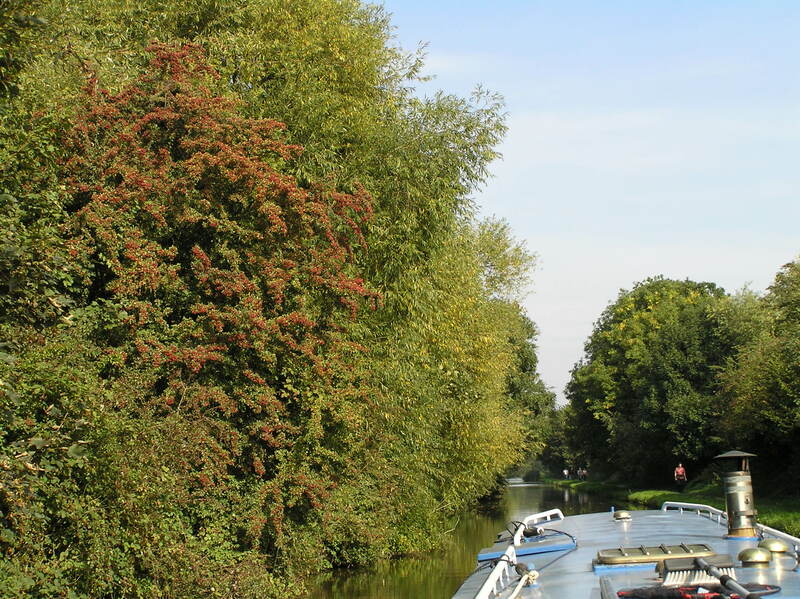 Narrowboat owners simply don’t have the space to season enough timber to keep them going. I don’t use wood, but I know how much coal I get through. Between October 2012 and June 2013 I burned over 80 bags. That’s more than two tons of the stuff. 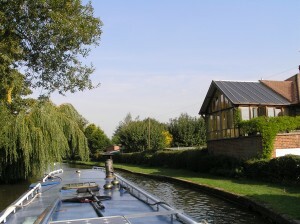 If the wood produces the same amount of heat pound for pound – I don’t know if it does – a narrowboat owner would need to carry four tons at any one time (two tons to season and two tons for immediate use)… and, ideally, the seasoned two tons would need to be kept under cover. I often see liveaboard boats with piles of logs stored on the boat roof. Those boats often have very smoky fires. Smoky fires are an indication of unseasoned wood. Unseasoned wood burns poorly, produces little heat compared with seasoned wood or coal and causes an accumulation of flu creasote and the risk of chimney fire. The exceptions are the many boats you see on the offside with a mooring with either a garden or some space for storage next to the boat. You will often see a store of logs which have probably been well seasoned. 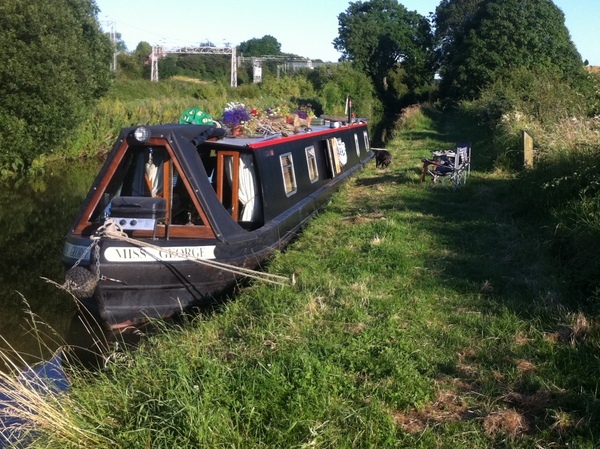 I think that the rule of thumb should be to use coal unless you have a mooring with sufficient space to store two or three season’s worth of logs. How good is your memory? Mine is awful. I can’t clearly remember what happened yesterday so I’ve no chance when it comes to cruises months or years earlier. The good news for me is that I don’t need a fantastic memory to be able to relive every interesting or exciting moment of my travels. I take photographs. I take lots of photographs. My photographs are my memory and what wonderful memories they are. I’ve just had a quick browse through my online albums. Actually, the intention was to have a quick browse. I strolled down memory lane for over an hour. I have hundreds of albums with a total of just over 30,000 photo’s. I purchased my first digital camera in 2001. It had a massive 2.1 million pixels and cost £1,000. These days, the most basic mobile phones have higher resolution cameras. I bought that first camera when my three boys, Blake, Brad and Brook were 7, 5 & 3 respectively. It was at a time when I got on reasonably well with my then wife and at a time when the boys were growing rapidly and changing almost daily. I can’t remember much about events from that period, or any other significant period of my life… until I look at the photo’s. Then the memories come flooding back. My ex wife was immovable when choosing holidays. The holiday had to be two weeks, had to be somewhere where there was guaranteed sun where she could lay for fourteen hours a day in the sun. She wasn’t lazy. Far from it. She managed to combine looking after three very active boys with her job as a very busy property lawyer. Holidays allowed her to collapse, rest and recuperate. I understood the need for her to take these types of breaks but they weren’t for me. I’ve always enjoyed the great outdoors and like to keep active. By 2007 we weren’t getting on very well at all and had been going to the same camp site on the coast about 100 miles north of Barcelona for five years in a row. I started to take breaks on my own and recharge my batteries in a way which suited me far more than a beach holiday. I went hill walking in Scotland. The photographs I took allow me to relive those adventures in detail. One of my favourite trips was to Ullapool on the north west coast of Scotland in August 2007. I drove there from my Warwickshire home. I stopped off in the Lake District on the way there for an exhilarating long day’s walk on High Street and an overnight stay before continuing to Ullapool. I stayed the night in an Ullapool B & B before being taken by taxi to Oykel Bridge, 30 miles north east of Ullapool. From there I walked back to Ullapool through the mountains. It’s a remote and stunning landscape completely devoid of human habitation. My first day’s walk was thirteen miles along a rough track in pouring rain wearing my new Paramo waterproofs. The rain didn’t get through but neither did the rivers of sweat I generated carrying a heavy pack while wearing thick waterproofs on a hot (for the Highlands) summer’s day. I couldn’t have remembered the details without referring to my photographs. The photo – click on it to show it’s full size – shows my accommodation on that first night in the mountains. 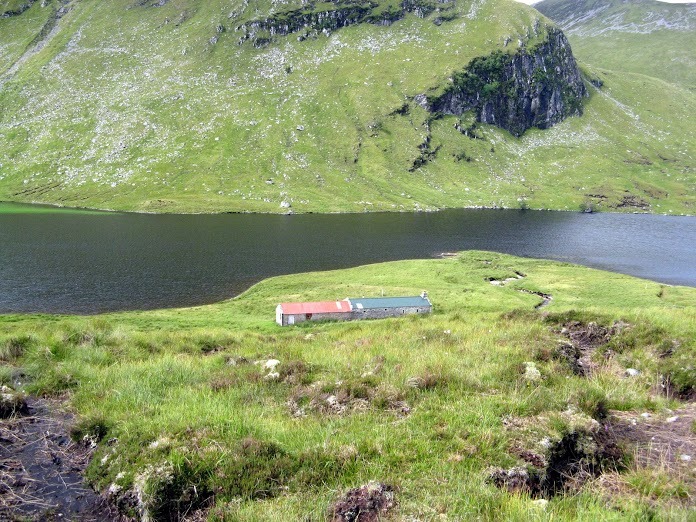 I had all my camping gear with me and enough food for a week away from civilization but I had read that there was a decent bothy by the side of the loch at the base of 3,000 feet high Seana Braigh. With plentiful photo’s to jog my ailing memory, I can now recall the whole trip in vivid detail. I can remember how delighted I was when, wet and tired with aching and sore feet, I opened the door to the bothy to find that, not only was it in a very good state of repair, but it had also been stocked with luxuries by persons unknown with hearts of gold. The bothy had an open stone fireplace but a fireplace is no good without something to burn in it. There was a pile of seasoned logs next to the fireplace and kindling and matches to light it with. On the mantlepiece over the fire where half a dozen substantial candles for nighttime lighting, a couple of packs of cards and, joy of joys, three different and completely full single malt whiskey miniatures. I lit the fire, changed into dry clothing, hung my sodden clothes on the drying rack over the now roaring fire. I heated a Wayfarer ready meal then relaxed in an old armchair next to the fire, reading my book with the aid of a head torch and slowly and reverently sipped one of the little bottles of single malt. There wasn’t a sound to be heard apart from the crackling fire. No road noise (the nearest road was thirteen miles away), no air traffic noise (this area of Scotland is a long way away from any commercial flight paths) and neither sight nor sound of another human being. I felt a profound sense of peace and, thanks to my digital memories, I can recapture that feeling whenever I browse through the album. The following day I left the bothy after a very late start, walked eight miles to another remote loch and camped almost within hearing of the waves lapping gently on the shore. I woke the following morning to the sound of grass being pulled from the ground very close to my tent. There were no sheep or cows anywhere near me so I didn’t have a clue what could be making the noise. The culprit was a magnificently antlered stag, peacefully grazing less than ten feet from my tent. I didn’t dare move to get my camera in case I disturbed it but I remember the encounter clearly thanks to the photo’s I took either side of the chance meeting. 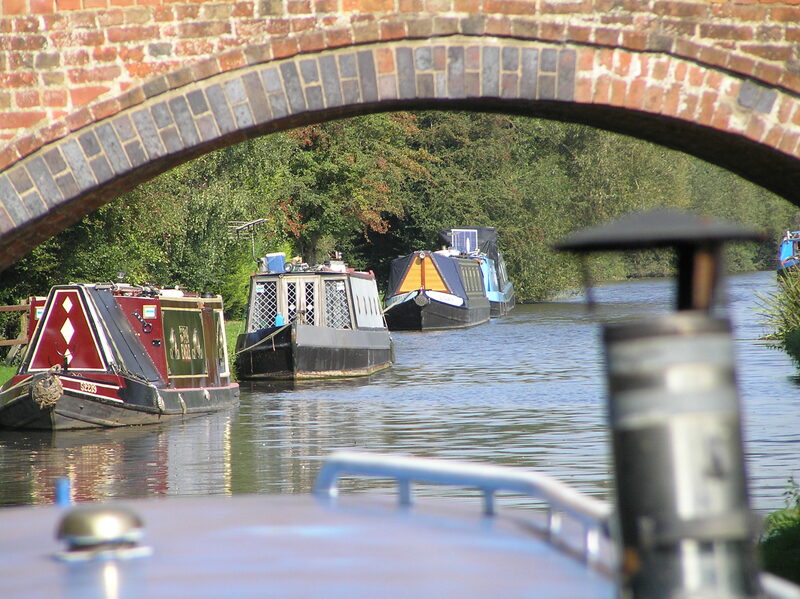 Why am I spending so much time telling you about one of my walking holidays when this blog is supposed to be about narrowboats, canals and rivers? Because cruising the network is an adventure, and adventure you’ll want to cherish if you’re ever forced to hang up your windlass for the last time. I haven’t started to cruise the network in earnest yet but the little cruising I have done has been recorded in detail. I’ve recorded my cruises by taking plenty of photo’s and by taking plenty of notes in the form of this written blog. I’ve been taking photographs ever since I’ve had children. The first eight years I used a film camera but I didn’t use it very much. I didn’t really know what to do with the camera so the results were poor and very expensive to have printed. My results weren’t much better when I switched to digital cameras, but at least there was no heavy printing costs to put me off taking the photo’s in the first place. Over the years I’ve bought dozens of books and enrolled on web based courses but the very best tuition I’ve ever received has been a fantastic downloadable package called 123DI (The 123 of Digital Imaging). It contains over 4,000 pages of step by step instructions and tutorials. Since I started using it, not only have I seen a huge improvement in the quality of the photo’s I’ve taken (and therefore the memories I’ve captured for the future), but I’ve also understood why the improvements have happened and what to do in most situations to ensure that I nearly all of my photo’s will stand the test of time. 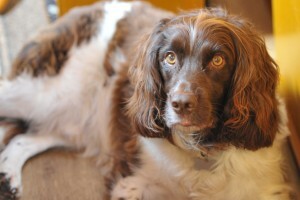 I love taking photo’s of my beloved springer spaniel Charlie. I’ve just taken one now and, using the the knowledge learned from 123DI, I’ve focused on his stunning eyes to make them stand out more. You can click on the image to see the full size photo. If you want to take high quality photo’s with just about any camera and regardless of whether you are at the beginner, intermediate or advanced level of digital photography, 123DI is an essential guide. You can download an evaluation version of 23DI here. There are some great tools available for managing and storing your digital images. I use Picasa from Google for organising my digital images and Google Drive for storing them. I used to have 30,000+ digital images stored on an external hard drive. After less than 12 months the hard drive failed. I had a quote of £400 to try to recover the lost images. I decided not let them try because (A) I couldn’t afford it and (B) all of my images are backed up to Google Drive the second they are added to my laptop’s hard drive. All of my photo’s were safely backed up, even if they weren’t backed up at quite as high a resolution as the originals. My 20GB of storage with Google costs me a ridiculously low $5 a year!. Finally, I use and recommend online publisher Blurb. You can publish your own books, complete with photo’s and text, at a very low cost. I’ve been using them for about five years now. I’ve created several photo journals documenting regular events as my boys developed. One of them, a 400 page coffee table sized book, cost just £50 to have printed and shipped from the USA (Blurb have since opened a branch in the UK). The books were loved and admired by all family and friends who browsed through them and are treasured by me. Here’s a screen capture of one of the books (Click it to see the full size capture). Just looking at the two photo’s here bring memories flooding back. I can tell from the caption on the photo that the event was a football match on Sunday 1st February 2009 in Balsall Common. Seeing the driving snow in the photo reminds me of how bitterly cold the day was and how cold my son Blake was (on the left in the red striped top). The photo on the right was taken just four days later on Wednesday 5th February. Heavy snow brought the country to a standstill. There must have been at least an inch on the road. The schools of course were closed so I had to stay off work to look after the boys. We went to a nearby nature reserve and built this snowman. The little fella sitting in front of the snowman is my youngest son Brook. I made him sit there because he had added a very impressive but totally unacceptable additional appendage to the snowman. These photographic memories are invaluable to me. If you don’t already have a camera, and you don’t have the gift of total recall, I urge you to go out and get one as soon as you can. I am in the process of adding my cruising photo’s and notes to another book. I know that this book and others like it will be among my most treasure possessions in the dim and distant future when I’ll be forced to sit with a rug on my knees next to a fire and remind myself what a wonderful life I’ve had. 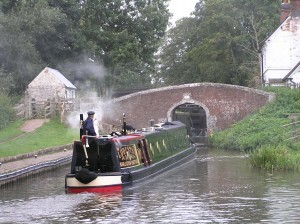 Nige bought himself a narrowboat this year. 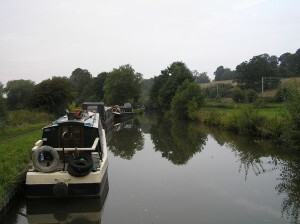 He wrote some very entertaining blog entries about his journey back to his new mooring when he first purchased his boat. He’s been out and about again, this time he’s gone solo. Nige is very good at translating his experience into the written word. 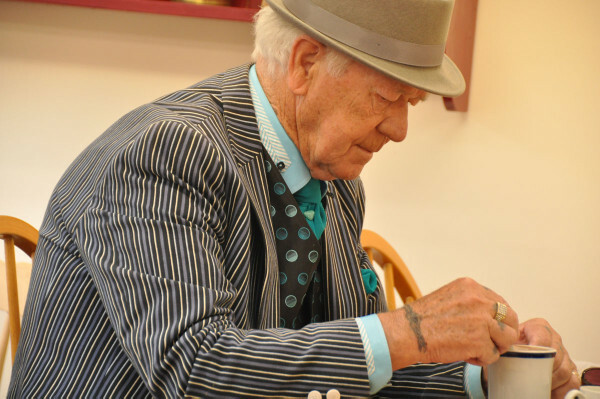 Grab yourself a coffee, settle down and read about his latest adventure. There are plenty of photo’s to keep you entertained too. There’s a full list of all of the posts he’s written below. The last eight are his latest solo trip. 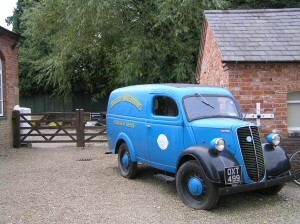 Steppin’ Out; The maiden voyage, Lymm to Castlefield. Steppin’ Out; Day 6 Congleton through the Harecastle to Stone. Our Nige; Joys of sunny days and The Dangers of The Dark Side. Our Nige; B****y Technology, steaming ears and high blood pressure. Steppin’out: My first solo venture. Steppin’out; Solo voyage day one. Steppin’out; Solo Jolly day 5, Great Haywood to Fradley. Steppin’out; Solo Jolly day 7 Branston to Mercia marina. 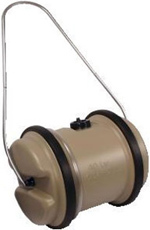 A Near Death experience, CO alarms a must and a costly mistake. What it’s all about and Willington pubs too. Steppin’ Out; 2014 world tour, day 1, Tuesday. 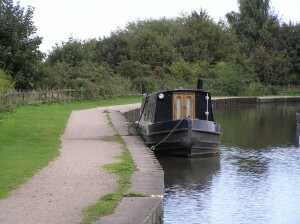 Willington to Burton. A bit chilly this morning and put the central heating on to warm things up. Quite a few boaters up and about early and not all of them very curteous as they were passind a good line of moored boats. Some of the boats and some of the people looked like they should know better. Can’t go by looks though can we? This boating is not exactly hardship avenue while out cruising is it? I sat with a coffee studying the form for todays losers at Market Rasen and Newmarket then had a long conversation with my brother on the phone. It comes under “best of both worlds” I think and I’m not knocking it. Off we go then heading down to Branston lock. It’s certainly just a tad up from breezy I think so paying more attention. 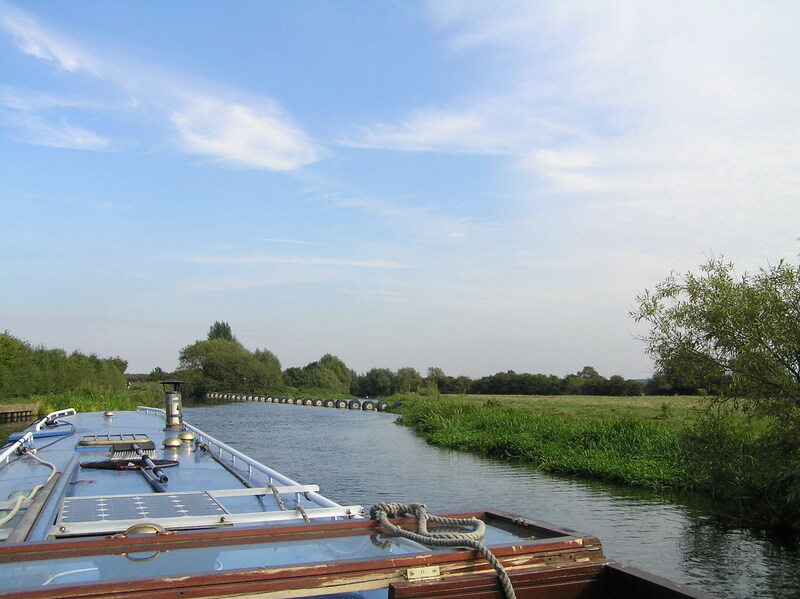 I had a good line coming in to lock mooring area behind a boat already there and just as the bow got to the bank and I started to bring the stern in the bow shot off with a mind of its own. With the bow on the other bank now I could revers and try to give myself enough room to turn and point back to where I want to go. This time with a little more force and the chap from the moored boat came and took my middle rope and we got moored up. Another came in behind as I pulled down once the first boat went in and we all came to lift and drop paddles and things. While there a cruiser came and he had a hell of a job mooring up too. Looks like being an interesting sort of day. Down and then on towards Burton with fields spreading out towards the hills and then you turn a corner and a great big square wharehouse built of sheet steel, as they do nowadays, is staring back at you. 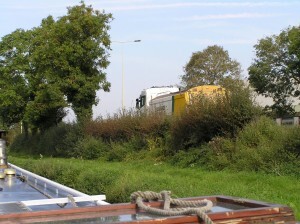 Another one on the other side of canal and the A38 to pass under and we are back in Burton. As I approached Shobnall marina at a sedate pace as there were boats moored someone was coming out so I had to sound the horn as I was about 10 yards from the entrance. They did stop and so no accident. Meandering through Burton by canal isn’t too bad as it keeps to the outskirts and goes by Shobnall fields where there were at least 3 youth football matches in progress. 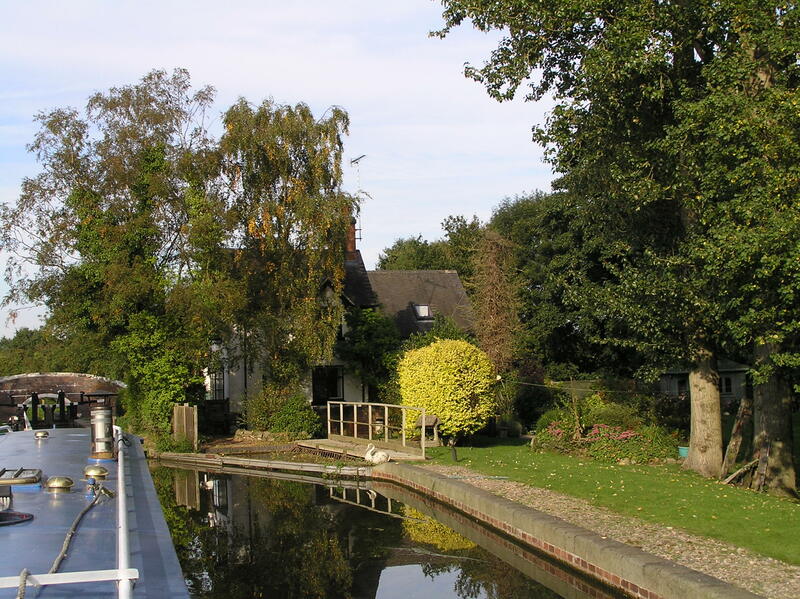 Now we come to Dallow lock which will be my last of the journey. The lock was full so only had to open the gate and enter. There was a Stenson day hire boat moored right up to the lock on the downside lock landing area with three couples in and one of them fishing. I decided to just say nothing as explaining they shouldn’t moor there might get heated and I didn’t fancy the hassle. I’m a coward really. As I came back to close the gates another boat approached so I waved to see if they were going through and no response. I stood waving with both arms above my and shouting hello loudly. I figured they were going through so opened the gate I’d shut and walked back down still waving and shouting and being ignored and I was virtually back to them before they acknowledged by existence. ” oh we were looking to see if they were going through” indicating the hire boat, which is fair, but I just wish people would respond when you’re waving and shouting. It’s my age, where are my pills. To say how windy it is today there are lots of boats out and about which makes it a bit tight in places and I slowed down and a couple of times stopped and hovered to make life easier for all of us. Would a thanks mate or a thank you be too much to ask? This makes up for yesterday I guess when all seemed to go right. 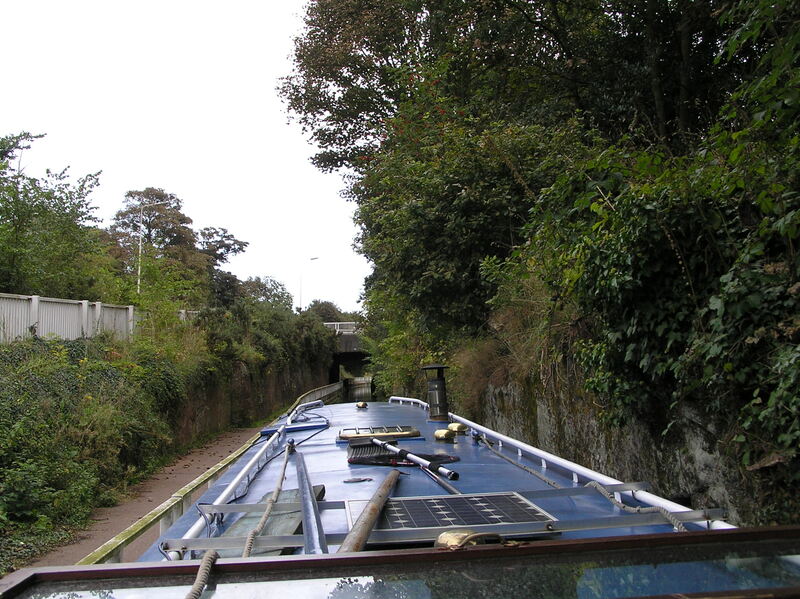 However I passed one boat where it was narrowed by a tree and there is a very narrow bit of canal, looks like it might have been a bridge at some time, with a boat the other side of the narrow who did stop for me even though it blew him onto the wrong side of the canal and I thanked him profusely. 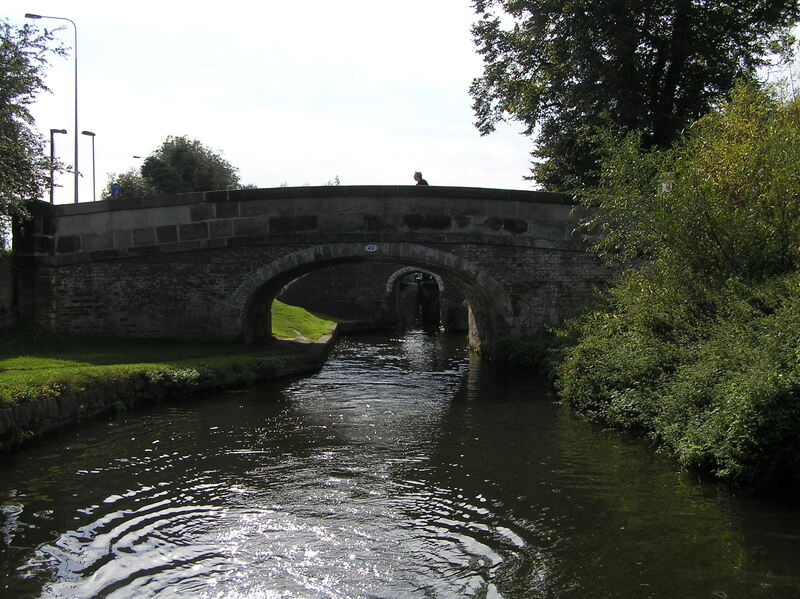 There is a narrow bridge just before you enter Willington and met two boats coming through so a bit more hovering then through and on to Willington. I had had a boat behind me for a while and he was still there as I got to the marina entrance which is tight on a good day in this direction. I had the one behind and one coming up infront and thankfully the man coming out of Mercia was stopped in pound just after the entrance so I could turn in and only bumped once. Home or very nearly now and as I entered the marina proper you could feel the wind coming at you. I negotiated a couple of turns and ran down the farside of my bay and turned in and was doing alright till the last minute and hadn’t quite got it right so bumped my mooring partner not too bad but not as gently as I would have liked. Good job he’s a nice man. Strange really but it does feel like I’ve come home and it does feel like I’ve been on holiday and thankfully it feels like I’ve had a good time and for a weeks holiday I’ve spent nothing really. If you ignore the boat running costs which you pay anyway a holiday like this is dirt cheap. I may have spent less than normal as I moored out in the wilds four nights and after all the fresh air each day I was a sleep quite early. I should be out night clubbing till all hours when on holiday, I’m only 56 I’m still young. Ok well maybe not and maybe I’ll do the boring stuff next time too. The last picture is a cheat I will admit as I took it one night about 2 or 3 weeks ago so it’s not actually this outing but it is taken off the back of my boat where I’m moored and so it is home. I look forward to my next outing and must post a bit more regularly than I have been doing. Thanks for following and your comments. What a beautiful morning to wake up to. Came as a bit of a surprise as I was expectin the same as yesterday. Took my rubbish to the bins and used their toilets then cup of coffee and mop out the engine and bay and decided to fill my grease gun and tighten the stern gland while I was down there and it was about 11 gone when I set off. Had to wait for the first lock but then help on the second lock and we are off. Down to Common Lock where a lady who had walked it to the butchers in Alrewas was coming up with her dog and we got chatting, she was one of those really nice people who brighten you’re day up and make you feel better just for bumping into them. She volunteered to shut the gates for me so another job saved. She looks a bit blured on the photo but she wasn’t quite as blurred as that in person. 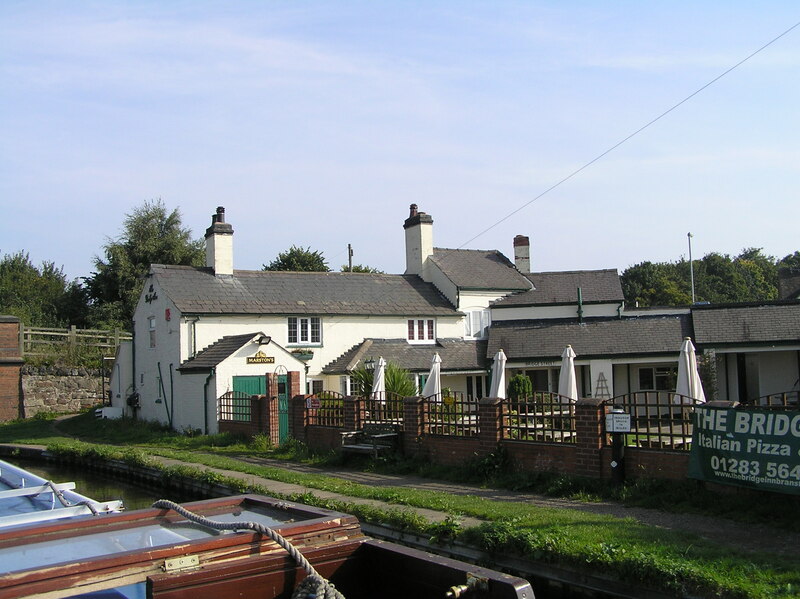 Then Bagnall lock as you get to Alrewas and I was also going to call on the butcher there as they are supposed to be veeery goooood. Someone coming out of the lock as I got there so straight in and then moored up a few yards after coming out to wander down the high st and try to find the butcher. I found the PO first which was good as I had a couple of items to mail that I’d sold on ebay and she told me the butchers was just a few yards after the pub and not to get side tracked. A very good butchers it appears to be. I picked up a lettuce and some toms on the veg and some smoked bacon and a home made pork pie but checked out what else they’d got. Good assortment of home made pies, scotch eggs, cooked meats and a few dishes with like stir fries in them where the meat and spices and bits were already in. Their meat really did look the business. I can’t stock up as I don’t have a freezer but it’s close enough for me to go by car from Mercia. I thought I’d better stop by the George and Dragon in the interest of information for my blog so I had just a half of Burton bitter. The pub is old and lots of wood with a friendly feel to it. They serve meals there and the smell was very tempting. 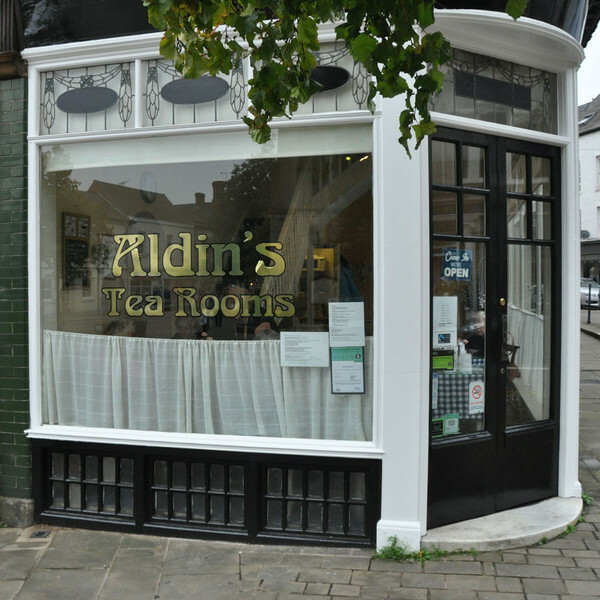 It was about 1 o’clock when I was there and it was quite busy. A good selection of hand pull beers and the Burton bitter I had was very nice. I shall be calling again when looking for a place to eat and will overnight at Alrewas next time I’m out and about. Moor at bridge 48 and just walk into the centre of town. The road is very quiet and this was Friday but the post office is there then the pub and the butcher and there could be a coop a little further down the street too. Oh and there is a chemist as well. Off we set again and it’s a nice little village, you get the sense that you need a bit in the bank to live here, and down to the lock before the river section and a boat coming up. A nice couple with their grandkids I think and he stayed behind and did the gates for me as I was on my own. All the friendly people seem to be out today. The river section is were the canal joins the river Trent for about a hundred yards and then turns of at the weir down into Wychnor. You can get stranded when the Trent is in flood as it can be closed to navigation. There is a notice board at Fradley junction saying whether the river section is open or not. 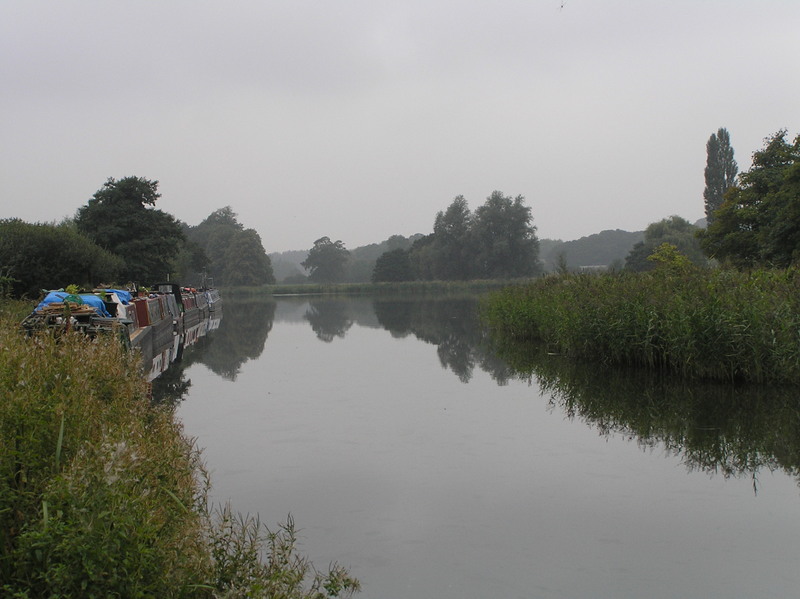 The water is much clearer through Wychnor as it’s river water not canal water and after the first lock it is still nice and clear. It’s lovely being able to look and see the weeds under the water bending with the flow, the slide as the shallow bottom at the sides slides down as it comes out to the middle. Plenty of tall reedy grass at the sides aroung Wychnor. I like it up there and more so as it moves furhter away from the A38. Wychnor Bridges lock and someone coming through again. My timing is good today or someones looking after me. This time they were a couple who had bought the boat yesterday. I passed some tips on as not to rush and not necessarily to tie up in a single lock and not to worry if they hit something so long as they hit it slowly. I’m not sure how much they took in. After I was in the lock and ready to open the paddle to empty it I had another lovely lady come to help me as she and her husband were coming up so a lot of work saved again. 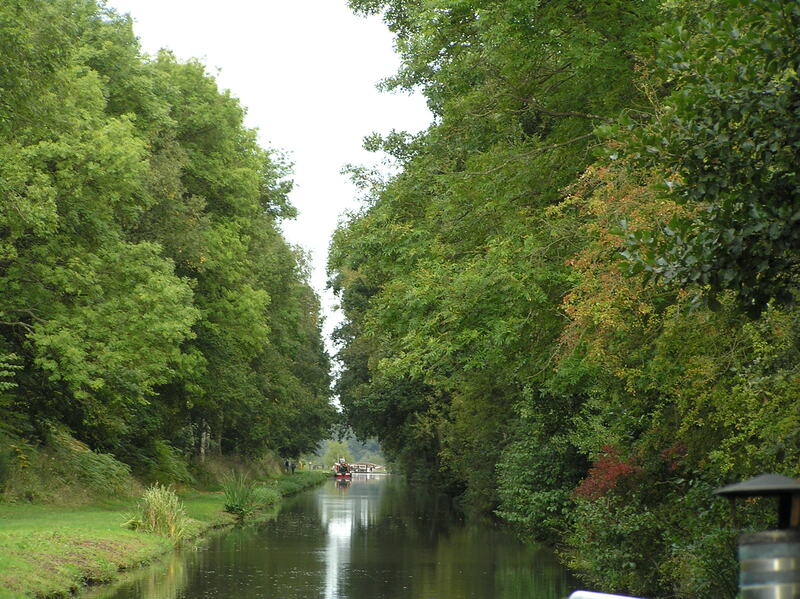 Here is were the canal meets the A38 and runs side by side for a couple of miles. It’s still lovely and picturesque but very noisy as the traffic speeds past about 15yds away. Not much further to go when you get to Barton Turns lock and a cruiser coming out as I get there so just hovered and went in. 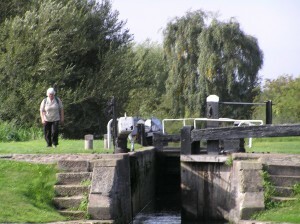 As I was leaving the lock another nice man asked if I wanted the gates shutting. I replied yes please and asked if he was coming down and he was just walking past and offered. If only the world was like this all the time. I shall wake up soon and it will all have been a dream. Tatenhill lock and no one was coming through, no one to help me. What is the world coming to? I shall have to complain to C&RT or someone. It is a lovely looking lock and yet over the hedge is a huge factory yard so it’s on the edge of an industrial estate yet feels, apart from the distant road noise, as though you’re in the middle of nowher. 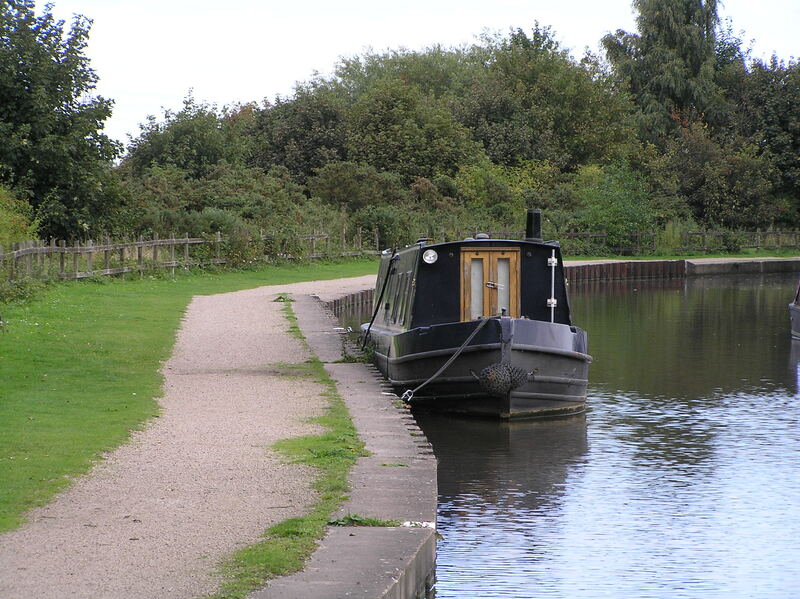 Now I want to find a mooring and there a few boats moored alongside Branston water park nature reserve and I find a piece of empty armco just about the right size to fit Forty Winks in so I reverse her in and tie her up and settled for the night. My last night of freedom. There is a pub just down the towpath which does pizza and pasta but I’ve already got my faggots in the fridge so faggots, chopped toms with cinamon and bisto, mushrooms and onions for tea it is. I have now eaten and returned to work on the blog. It was just what the doctor ordered well probably not the faggots as they probably have a lot of fat and preservatives in but they were nice. I’ve just looked out the side hatch and it feels like a summers eveing. Lights down by the pub, just the faintest feel of a breeze, the water flat calm. The night is dark and a few clouds but no moon yet. After a week out and a day like this I could almost think about living on a narrowboat. I shall have to give it some thought. This is tonight’s mooring with the sound of the A38 droning noticeably but not too disturbingly. 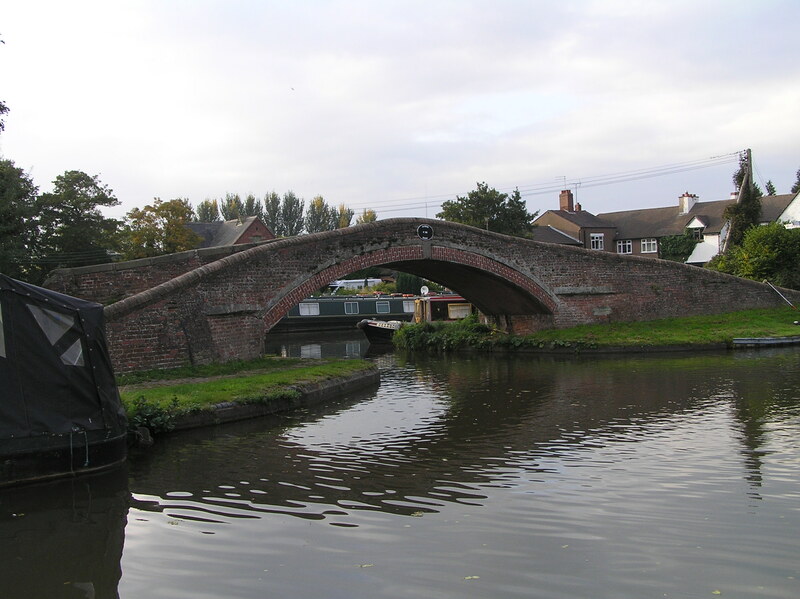 The Trent and Mersey canal from Shardlow upto Willington follows the A50 then the A38 takes over till you get to Wychnor Bridges where they part company, thankfully. But canals were built to carry freight and they follow roads and train lines so we have to grin and bear the times when they are side by side or closer than we would like. Oh a passing comment on the tradition of partaking of a glass after mooring up once the travelling day has been completed. No it doesn’t matter what time it is. Today I had a glass of Talisker whisky which is distilled on the Isle of Skye and is the finest tasting whisky that I have pertaken of, well so far but there may be better, it danced on my tongue while my taste buds sang halleluiah. There may be people with more money than me, infact there are lots of people, but on a day like today there aren’t many that are richer than me. Thanks to all of you who shared it with me in person, a few minutes here and a few minutes there and thanks to all of you reading about it. Hope it entertains you, relaxes you or brightens your day just a little. Hey what happended overnight? It’s about 10 degrees cooler than yesterday and it’s a good bit breezier too. This is going to be a little bit of a different day to last few but never mind. There seems to be a few folks up and about and they seem to be in a hurry too. 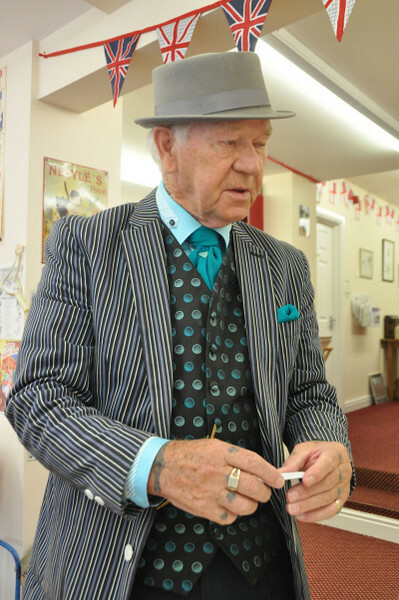 Thanks to Pearley for the courtesy article which explains about tieing up properly. The forward rope out front so it pulls forward and the stern rope out back so it pulls you backwards really does make a difference when people go past too fast. I’m not being thrown about as much. Today I’ve had to put on two t/shirts and a fleece and my hat now the temperature has gone down, I have still got shorts on but I wear shorts virtually all year round. Ok so some of us are a little different this allows you normal people to feel a little superiorl. Off down to Colwich lock and having got in the lock met by a nice lady coming the other way and shared a really nice conversation. She was a lovely lady to start the day off and on leaving the lock her husband a pleasant chap too with one of those boats with the engine Paul was talking about a while back where they fire about once a minute. Makes my Kubota engine sound like a two stroke. Nice boat too, see picture. Through Colwich again which is a picturesque type of place then back out into open country side. Now I’m going through the same places that I came through on the way up so I shall have to think of new things to say and makes sure I don’t use the same photos or you’ll rumble me. It is a bit breezy and it’s pushing the boat about a little as well making me keep the collar on my fleece turned up and my hat pulled well down but it’s dry and the sun is trying to shine. I’m not encountering many boats so I’m just plodding along at 3 mph ish. 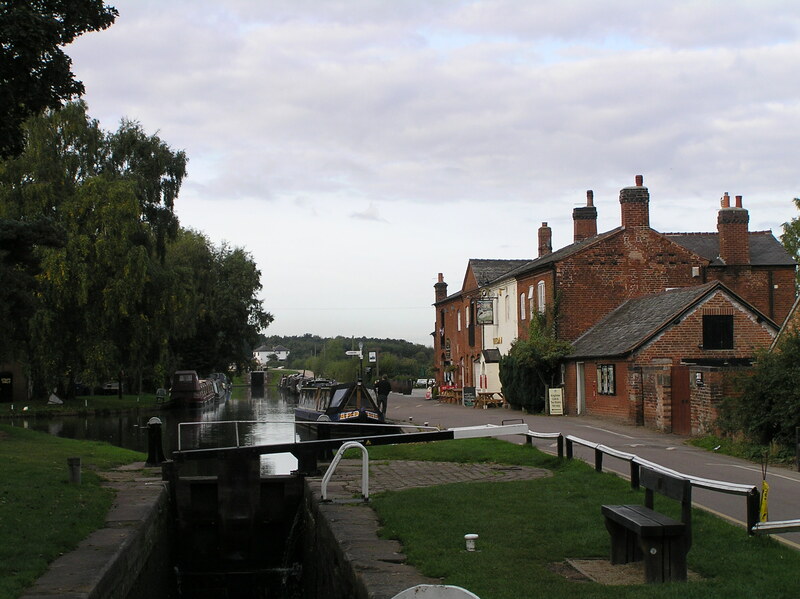 I’m only heading for Fradley which should be about 11 miles and only 3 locks so no rush. Bridge 68 is the turning point where the open country changes to a few trees and then turns towards Rugely and the aqueduct over the Trent that says you’re there. 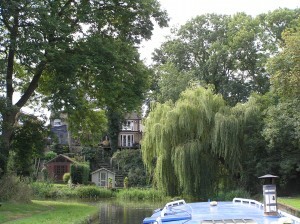 the first part is nice houses and gardens that slowly sort of turn a little less nice then becomes the town centre where there is plenty of mooring but today most of it is taken which makes it quite narrow and would have made life interesting if I’d have met anyone coming the other way but I didn’t. Rugeley merges with Mossley and a working factory then down to the Ash Tree pub and Ash Tree boat club moorings, Hawksyard Priory golf club and moorings then the Armitage tunnel, with no roof. 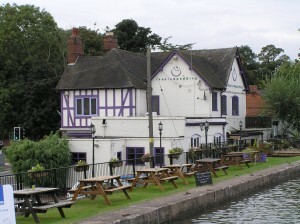 Coming out the other end you fall upon the Plum Pudding pub with moorings and lots of tables outside. I must try it next time I’m up this way as it does look like a nice pub. Then the alotments. Now being of a sound mind and steeped in logic and a Physics O level I understand totaly about water finding it’s own level and Archimedes and all that jazz but from Hawksyard priory I have had the feeling that i’m going uphill and I’m enclosing a photo to back up my theory. Look at the boat and the bank is nearer the gunwhales at the back than the front indicating that is indeed on an incline. Your honour I rest my case. 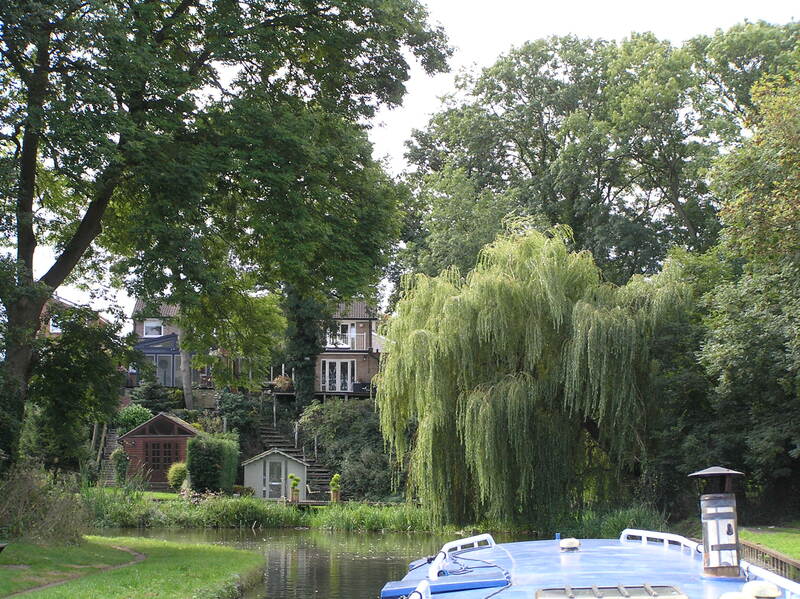 Now on to Handsacre which boasts some nice properties at the side of the canal, again only a few boats compared to the number of properties. A left turn, under a bridge and back out amongs the fields and trees. 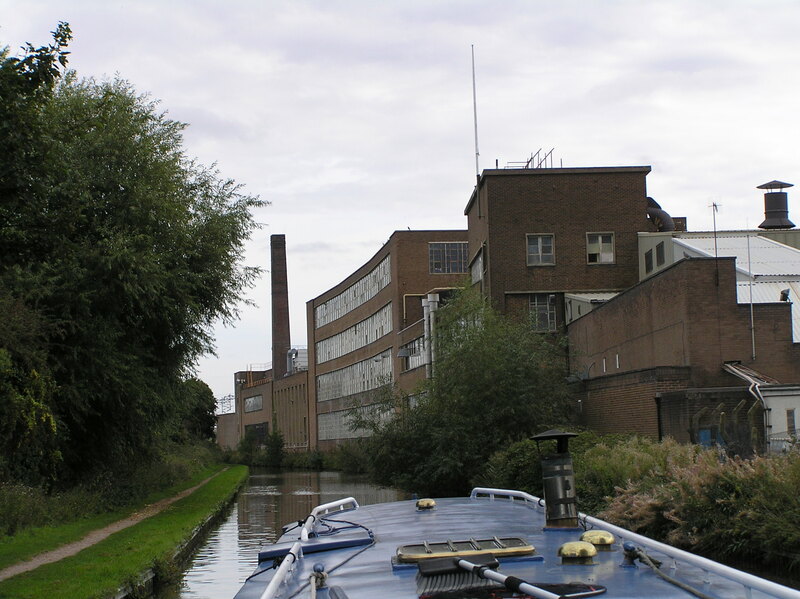 A mile of lovely scenery and just before Kings Bromley Wharf I pass a couple hosing down the frontage where it looks like they’ve been concreting, they are stood next to a concrete mixer, and we pass pleasantries and they look as though they’ve earned their supper. Kings Bromley Wharf with a big sign up saying “No Winging”. Is it me but why are people so mean and mardy when there is ample room to wind. On the roads you see signs no turning. What mean people are they that don’t want to allow someone to use their space when as far as I can see it will do no harm what so ever. Is it just me? 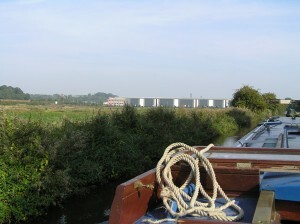 Down past Kings Bromley Marina, a seperate enterprise, and onto what is at the moment one of my favourite stretches of canal. Lovely tree lined canal. Lots of Oaks and Silver Birch lining the banks and then a slight left turn and a long straight with Ravenshaw wood on one side and open fields on the other. This was where I overnighted on the way up, a lovely place. Woodend lock followed by a sharp left and the top lock at Fradley junction is in the distance. A couple of locks and I’m moored up in the middle section. Nip to the loo and check out the showers. These are BW and are in very good order, no problems at all. After a shower it’s up to the Swan pub for a couple of pints and I chose to have the lasagne which came with chips, side salad, garlic bread and I had a side order of onion rings. The lasagne was very nice, probably microwaved, the onion rings were possibly the best I’ve had in a pub anywhere but the chips were frozen and I do love chips where some one has peeled a real potato the same day as they are fried, but that’s what you get in some places, they were ok. I didn’t leave any so they couldn’t have been too bad. Bar staff and a lady I took to be the Landlady were good and the customers were friendly. I felt welcomed and at home within a few minutes. I had the Thatchers Gold cider which is nice and they had a good selection of real ales on too. The menu isn’t extensive but enough choice and with vegetarian options. A few people said the Sunday dinners here are wonderful and it get’s packed apparently. A couple of pints and a meal. Watched some good sized carp taking bits off the top of the water then back home to write my blog. They have a folk night here on Thursdays but I’m tiring so I will miss it tonight and have to call round by car another time and join them. I lit my first fire of the week tonight as it was dropping a little cooler as I came back from the Swan so I am now well warm and cosy. Falling asleep over the computer so it’s time for bed. Night folks and tomorrow we can do some moor. It’s been an enjoyable, funny, different sort of day today. With friends meeting me it was always going to be a round trip back to where we started kind of day. Rather overcast and drizzly which actually turned into heavy drizzle and while planning routes on the computer, I’d opened the side hatch as I like to do if I don’t think it’s cold, and looking at map books and raising a hand to passers by, as you do, and this youngish guy sort of stopped and said something about it being cold and raining and I said it didn’t seem cold and I hadn’t realised it was raining and he laughed and said it was cold when you’d slept out all night and he walked off. I’d assumed he was a boater as he had what I thought was a carrier of rubbish in his hand. He was polite and not threatening and normally well spoken and definitely not aggressive in manner, mid twenties or early. It was seeing a few homeless folks in Leicester about 10 years ago that got me into care work, which I’ve just come out of this year, and now felt like I should have made him a coffee and had a bit of a chat but I find it daunting and while in care always worked with adults with severe learning difficulties in registered care which is a different ball game. Anyway the rain had about stopped my friends were getting nearer so I got ready started her up and I has I was only just down from the lock went up to open the gates as I’d seen a boat come down but when I got there the top gates leaked so it had filled up enough for me not to be able to open the gates and I hadn’t taken my windlass with me. As I was walking back a couple of boats arrived so ended up third in the queue. Next time I will move my boat up. 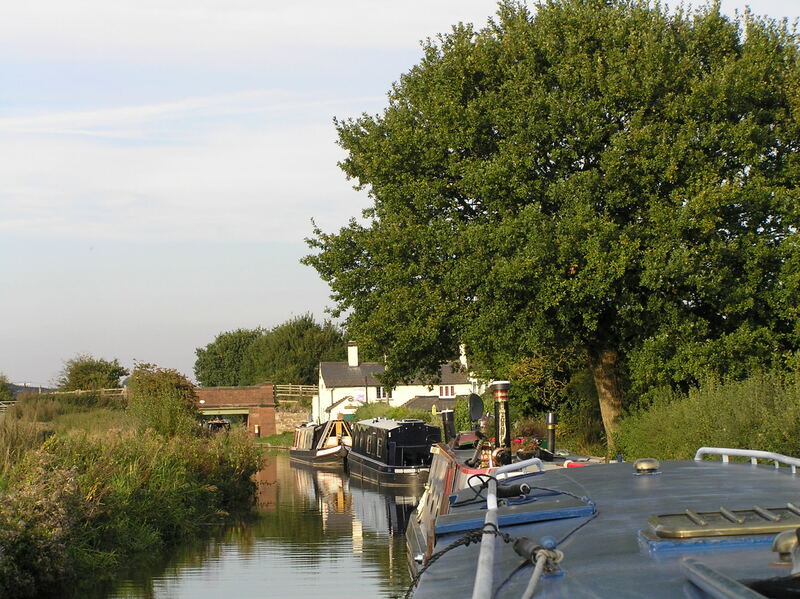 Once through Haywood lock it’s only a spit up to the junction with the Staffs and Worcs and stopped and picked my friends up. It was by now about 11 am but I’d sorted a little route out so we didn’t have to rush or be travelling all the time so we set off up the Trent and Mersey. I just feel that most of the canals I’ve seen are beautiful places to be unless they are running through cities or towns and some of them are pleasantly different. Lovely reeds and trees and fields which if the sun had been out would have been even nicer but still picturesque. Just one lock going up, Hoo Mill lock, and I was explaining to Brian what we needed to do and a boat caught us up so after opening the gates I went back for the boat and this other chap quite happily explained and showed Brian what happens and why. There really are some nice people about, some not so nice and grumpy but we won’t dwell on them. Through the lock and more lovely open countryside. Brian was on his third cup of tea by now. Caroline his wife and me don’t really drink that much tea and coffee so we let him drink alone after the first one. under bridges 77 and 78 then wound in the winding hole and a slow trundle back down to Great Haywood and moored up so we could nip to the shop there. Be very careful with this shop as a loaf of wholemeal bread, which was all I went in for, cost me £11 odd. OK so I added two home made faggots, a bulb of garlic, about a kilo of tomatoes, a jar of Staffordshire honey and a huge two scoop ice cream waffle cone, Cherry and Passion fruit which was delicious. So if you’re passing through or near Great Haywood this canal side farm shop on Mill Lane also does a selection of fresh veg, cheeses, cooked meats, fresh meats, fresh bread, home-made cakes large and small and all as far as I know of very good quality, not cheap but not too bad. So this is place to be avoided as you will spend more than you intended unless you’re of the iron willed brigade or devoid of any taste buds. It is a diet breaking shop. 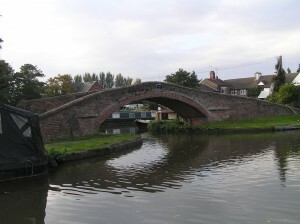 From here we had to go about 50 yards and turn right into the Staffs and Worcs canal. At the junction the T&M is very wide, the bridge is high and wide and the S&W is quite wide compared to some junctions I’ve seen and there was no wind to speak off. Don’t you feel a plonker when you miss it by a country mile and have to use reverse to get enough room to spin it round and she’s only 50 ft. Never mind I’ll get another go sometime. Over the narrow aqueduct and onto the canal proper and there on the left is an almost submerged day cruiser which would have sunk further but it was on the bottom. Does the C&RT come round and fish these boats out or are they just left there for ever. 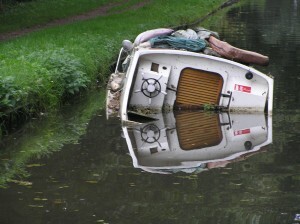 There seemed to be quite a few sunken boats around Manchester. 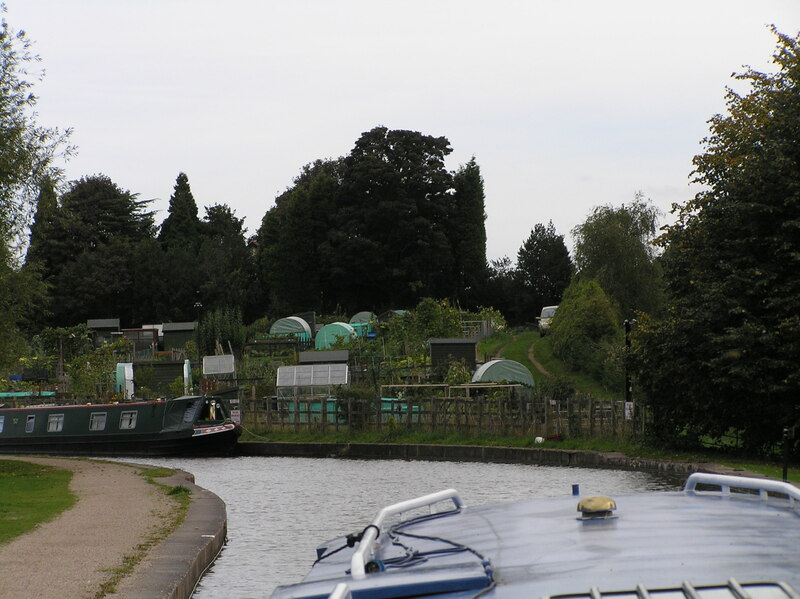 Down then a short distance to the Tixall wide. As we approached there was a mooring so we took that in case there weren’t any more further down. There was a long line of boats which didn’t look to have any spaces. Popped a light under the steak and kidney in the oven and we had a walk down the wide where there were some spaces further down. It’s quite nice down there but was as stated above quite busy. For anyone interested we only had mashed potato with our steak and kidney, whipped with butter and milk, potatoes should be just under cooked so they can be well mashed and handle the butter and milk without going gooey. Even though I say so my self it was bloody lovely and Brian and Caroline said so too. Wash the pots after a cuppa and wind round and back to Great Haywood where upon re-entering the T&M we couldn’t find anywhere to more. I hate to think what it’s like in the summer. We couldn’t find anywhere and were back at the lock near Shugborough so they walked it back to the car and I decided to go through and then find somewhere to more as there is a long stretch from the lock so shouldn’t be a problem. As I moored up the boat to go back and close the gates I saw the same guy from this morning sitting on bench seat a bit down the canal so after I’d been thinking about it part of the day I was now faced with a dilemma. I could just have ignored him and trundled off down the canal. I could have stopped and offered him a drink and a chat, which I’m not sure I was ready for so I took the easier option of greeting him and asking if he had any money, which he hadn’t, so gave him a few pounds and though he seemed like he would welcome a bit of time and a chat as much as the money I said see ya and moved off. A chat would have been good for him I think. I need to look into doing a bit of voluntary work somewhere now I’m not in care. All this philosophical stuff is for my benefit and can be ignored by the reader if you wish to. It does show that we all come from many walks of life and the canals and surrounding areas contain life in all its diverse and many coloured facets. Sometimes you get a second chance to make a bit of difference to someone this was a very quick second chance. 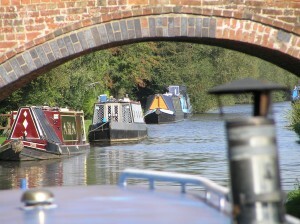 The light beginning to fade as I neared Colwich lock and found a nice place to moor up among a few other boats. Might be a bit close to the train line but should be OK. Nice aspect out over the fields. A couple of glasses of Scottish flavoured water and lost internet connection so that’s why I’m finishing this off this morning. I did sleep well. May God bless you all and lead you into places where you’ve always wanted to go, really. Have a great day and I’ll see you tonight.